Halloween has just passed and the stores are already full of Christmas décor. Most people feel like they don’t have time to catch their breath and then the holidays fly by in a blur. Research confirms holiday stress is real and while it can be an exciting time, the holidays can also bring on a lot of pressure. The holiday stress can also affect men and women differently. Communicate through it: Take the time to check in with your partner. Something as simple as asking how they are doing can help them feel more supported. Express appreciation. “Hey, thank you being patient with Uncle Rick. I know he’s not your favorite person so I really appreciate your effort,” can go a long way to soothe holiday burnout and encourage positive feelings and interactions. Ask for help. Do it with mindfulness. Make sure you aren’t just barking orders but instead are reaching out to your partner and clearly letting them know ways you could use some support. Talk about your expectations for the upcoming holidays. Where will you spend Christmas Eve? What about Christmas Day? Who’s cooking? What do you need to prepare? Who’s organizing what events? What do you need help with? Would you prefer not to go to spend the night at your mother-in-law’s again this year? What traditions are important to you? Now is the time to discuss those details before the holiday hustle sets in. Respect each other’s space. Make sure each of you are getting some time to yourselves doing activities you enjoy – golfing, dinner with friends, getting a mani/pedi, going to a yoga class – whatever helps you feel more sane. Share the load, offer to give the other some quiet time or time to take care of their to-do list. Take the kids for an afternoon or take your mom and Aunt Suzie out to lunch and give your partner the house to themselves for awhile. Pick your battles. Maybe you can’t stand another one of your father-in-law’s jokes or maybe the way your in-law’s house smells just gets on your nerves. Everyone seems to have that one family member who can be difficult to be around or that one event they really dislike attending but unless it’s a big issue, let it slide. It’s the holidays after all! Putting that added pressure on your partner or putting them in the middle is not worth it. If you know it’s coming and you know it’s going to be an issue, have that conversation before the heat of the moment. See step 1.d. above. Take time to connect. Be in the moment and let gratitude in. One of the most important things you can do for yourself, your partner and your relationship is making time for one another. 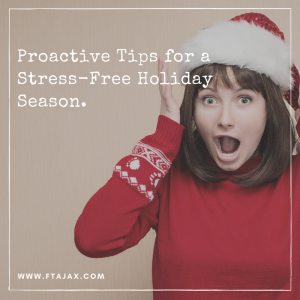 The holidays can be hectic and it can be easy to get lost in the chaos. Make it a priority, even if it’s just having coffee in the morning or talking for 20 minutes before bed. Plan at least one holiday themed date night where you can both relax, enjoy one another and get in the holiday spirit together. It’s no secret the holidays can be hectic. Staying connected with your partner when you’re preparing a huge Thanksgiving meal and your husband is watching football or your wife is shopping and you’re watching the kids again can be hard to do. Pay attention to how you’re feeling and include your partner by letting them know. Utilize their support and make it through the holidays a stronger couple and a happier you! Don’t forget to check out our upcoming blogs in this series on beating holiday stress – thoughtful gift ideas and close-to-home getaways to help you reconnect after the holidays! Need help navigating the holidays? We can help, schedule conveniently online.